Joseph Hoffmann (1870 Pirnitz/Brtnice, Moravia – 1956 Vienna) was an architect and designer who played a central role in the most important artistic events to take place during the cultural flowering of turn-of-the-century Vienna. Hoffmann was born in a small town in Moravia. He recalled that the Moravian folk art and Biedermeier designs that surrounded him during his childhood were significant influences on his later work. His interest in architecture was sparked when he visited building sites with the son of a local architect whom he had befriended. Hoffmann studied architecture at the Höhere Staatsgewerbeschule (Senior State Commercial and Technical School) in Brünn/Brno. (Interestingly, Adolf Loos, who would later become his architectural rival in Vienna, also attended the Staatsgewerbeschule in Brünn, as well as the same grammar school as Hoffmann.) In 1892, Hoffmann was accepted into the architecture program at the Akademie der bildenden Künste (Academy of Fine Arts) in Vienna. Two years later, the architect Otto Wagner took over the program there, and he had a formative influence on Hoffmann’s work. Hoffmann would, like many of the best young talents from the Academy, later work in Wagner’s studio. In 1895, Hoffmann became a founding member of the Siebener Club (Club of Seven), a group made up of forward-looking artists and architects, including Koloman Moser and Joseph Maria Olbrich. He also won the Rome Prize and, in the following year, traveled to Italy. In 1897, Hoffmann, along with Moser, Olbrich, and Gustav Klimt, among others in Vienna’s avant-garde, was a founding member of the Vienna Secession, the multi-disciplinary group of artists that broke away from what they saw as the conservative Vienna Academy and its historicist style, to create new, modern art. This modernity, they believed, could and should be seen in daily life—in architecture and interior design, furnishings and objects—just as much as in paintings. Hoffmann contributed to interior design for the Secession’s building, designed by Olbrich. His designs for the third Secession exhibition established him as a significant talent in exhibition design. By 1899, Hoffmann was appointed professor at the Vienna Kunstgewerbeschule (School of Applied Arts), a more progressive institution than the Academy. He would teach architecture and applied arts there for 35 years. He also sought out his own architectural commissions, such as the renovation of industrialist Paul Wittgenstein’s country home, which established a life-long relationship with the patron. Hoffmann designed the rooms for the Kunstgewerbeschule and the Secession at the 1900 Paris Exposition Universelle (World’s Fair). He also visited the Guild of Handicraft in England and arranged for Charles Rennie Mackintosh, the Scottish architect and designer, to show a room of his design at the Secession. This direct contact with the British arts and crafts movement would continue to influence Hoffmann. 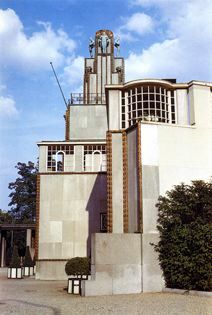 He began plans for an artist’s colony to be located in Vienna’s Hohe Warte suburb, and was commissioned to design several houses there, including those for Koloman Moser and Karl Moll. In these, Hoffmann achieved his goal of conceptual unity of architecture and interiors. Hoffmann directed the design of the 1902 Secession exhibition, which realized the new ideal of the ”Gesamtkunstwerk” (total artwork)—a unification of artists and craftsmen of different disciplines (painting, sculpture, architecture, design, etc.) in the creation of an overarching concept. The exhibition was devoted to Beethoven, with his music playing (in an arrangement by Gustav Mahler), the display of art and design created especially for the occasion (notably, Klimt’s Beethovenfries) and, at the exhibition’s center, Max Klinger’s monument to Beethoven. The geometric, abstract forms of Hoffmann’s ornamental wall reliefs for the exhibition were groundbreaking. In 1903, Hoffmann, Moser, and financier Fritz Wärndorfer founded the Wiener Werkstätte (Vienna Workshop), the art and design collective that would be the source of some of the most inventive and influential work created during this period. The Werkstätte took the “Gesamtkunstwerk” as its central ideal. Beyond its conceptual foundation, the Werkstätte had the important function of being an entity through which the work of its collaborators could be fabricated, exhibited, and commissioned and sold. Hoffmann and Moser closely collaborated on the design of much of the Werkstätte’s early production, with its trademark geometric simplicity (so much so that it is sometimes difficult to discern the work of one from the other). The Werkstätte’s creations eventually included graphic arts, furniture, ceramics and glass, silver, fashion and textiles, bookbinding, and toys, in addition to architectural and interior design projects. There were Werkstätte stores in Vienna, Berlin, and, later, New York, and the Werkstätte would remain active in various forms for close to 30 years, until 1932. Moser left the Werkstätte in 1907, but Hoffmann retained a post there until the organization’s final dissolution. The Purkersdorf Sanatorium, designed by Hoffmann in 1904, is a highlight of his architectural work and the work of the Wiener Werkstätte. The luxury spa was a model of modern geometric simplicity and clarity. Hoffmann and Moser collaborated on the interior design, and all of the furniture and fixtures were produced by the Werkstätte. From 1905 to 1911, Hoffmann and the Werkstätte created the Palais Stoclet in Brussels, their greatest “Gesamtkunstwerk,” and, arguably, Hoffmann’s greatest work. Hoffmann was responsible for all architectural and interior design, with a range of contributions from artists and artisans associated with the Werkstätte: Klimt designed a mosaic frieze for the dining room, Karl Otto Czeschka the windows, and Michael Powolny the ceramics. In 1907, Hoffmann and the Werkstätte also completed the Cabaret Fledermaus in Vienna, with contributions from Oskar Kokoschka, Berthold Löffler, and others. Many of Hoffmann’s private commissions came from wealthy art patrons and members of the cultural elite, who all moved in the same circles. The Purkersdorf Sanatorium was commissioned by Victor Zuckerkandl, one of Gustav Klimt’s great patrons. Hoffmann designed a house in Vienna for the writer Richard Beer-Hofmann (1905-06). He designed a country house for the industrialist Otto Primavesi (1913-14), while Klimt painted portraits of Primavesi’s wife and daughter. In 1914, after Fritz Wärndorfer went bankrupt, Primavesi took over financing of the Werkstätte. Among public commissions, Hoffmann designed the Austrian pavilion for the International Art Exhibition in Rome (1911). In 1925, he collaborated with several other designers on the Austrian pavilion for the Exposition Internationale des Arts Décoratifs (International Exhibition of Decorative Arts) in Paris. The pavilion was widely praised, and Hoffmann received the Order of the French Légion d’Honneur. The Austrian pavilion for the Venice Biennale was built in 1934, although Hoffmann had begun designing it much earlier. Following World War I, more of Hoffmann’s private commissions came from Czechoslovakia, which was more economically secure than Austria. In 1925, he received a commission from the City of Vienna to design low-income housing. Hoffmann would maintain a continuing interest in work on urban planning and other major projects. After the Nazi annexation of Austria, Hoffmann accepted the commission to convert the German Embassy building in Vienna to the Haus der Wehrmacht, a club for German Wehrmacht officers. In the last decade of his life, Hoffmann worked mainly on housing projects for the City. In 1956, he celebrated his 85th birthday at the Palais Stoclet and, soon after, died of a stroke. Although his first interest was architecture, Hoffmann was a prolific designer, and it is his design work that has come to be more well known and influential. His elegant, inventive use of geometric forms in furniture, metalwork, glass, porcelain, and other media is unique and unmatched.